Current: NEW CUSTOM MARBLE ACRYLIC PORTFOLIO BOOKS! Drum roll.....! We're thrilled to release our latest exclusive treatment for your most awesome custom Klo Portfolio book. The newest edition to the Klo treatment family is our Marble UV Print & Cure which mimics the beautiful swirls and appearance of marble itself while avoiding the pitfalls of the actual marble stone such as its weight and price. The Marble UV Print & Cure is exclusive to Klo Portfolios and is created in house by our Portfolio Artisans. 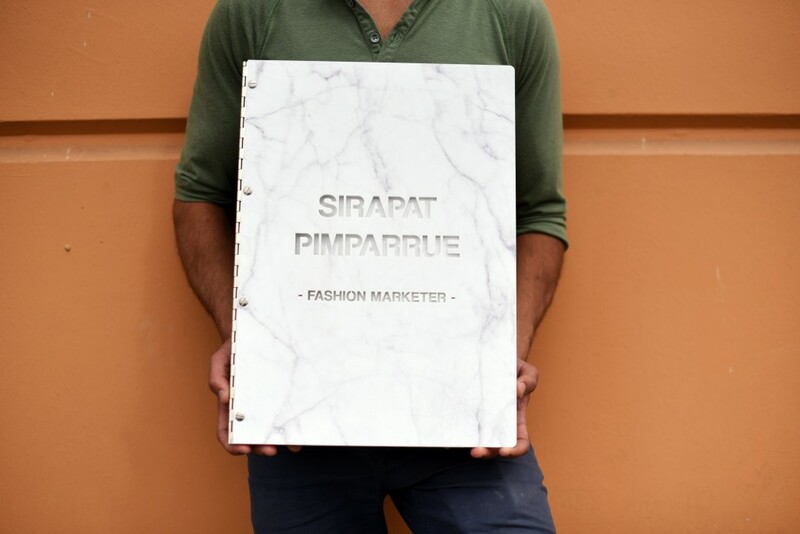 The marble pattern is UV printed and cured for a seamless look on the front, back and inside covers of your custom portfolio book, creating an overall cohesive appearance. Marble is known for its prestige, refined taste and grand aesthetics. The word marble itself comes from the Greek word 'marmaros' which is defined as 'shining stone.' Marble ranges over various cultures, backgrounds and timelines. Italian sculptures preferred marble for its durability and translucency to create stunning masterpieces of art. The Taj Mahal's commissioner, Shah Jahan, chose marble for its refined elegance as a token of love to his wife Mumtaz Mahal and created one of the seven wonders of the world. Safe to say, you are in great company! Today, marble is being revived as a classic and historically significant stone and can be seen heavily in modern architecture and interior design trends. As with all our other screwpost portfolio treatments, you can engrave, color fill, cutout and UV Print on top of your marble portfolio! 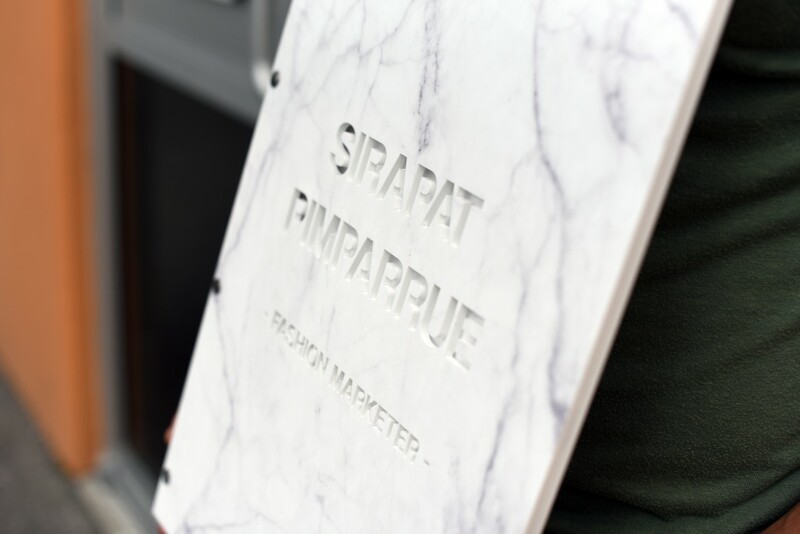 Engraving on your custom marble portfolio book allows you to etch or carve your design into the material itself, while a color fill can allow for your engraved design to stand out with your choice of any CMYK color. A cut out treatment can create a peak through preview for your work underneath, and is the ultimate custom treatment. Last but not least, the UV Print & Cure treatment can be utilized for any CMYK image or vector that allows you to represent a range of colors. Check out our blog on how to represent treatments in your design template. Of course, you can always combine various treatment together to achieve your perfect look. The options are endless. 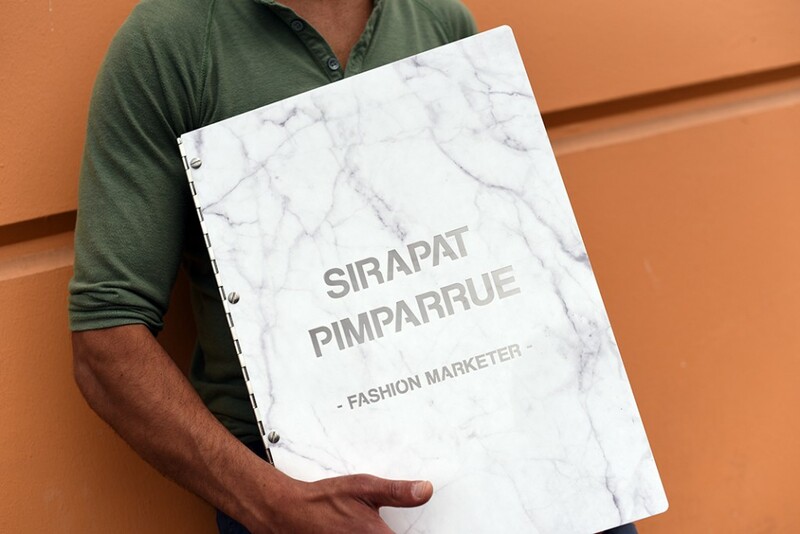 Let your imagination soar for your designs and let us create for you a marble masterpiece to tote your work. Check out our gallery to see our various treatment examples on custom screwpost portfolios to get your gears in motion.